Human Bean holiday gift ideas are endless but here are a few of our favorites! 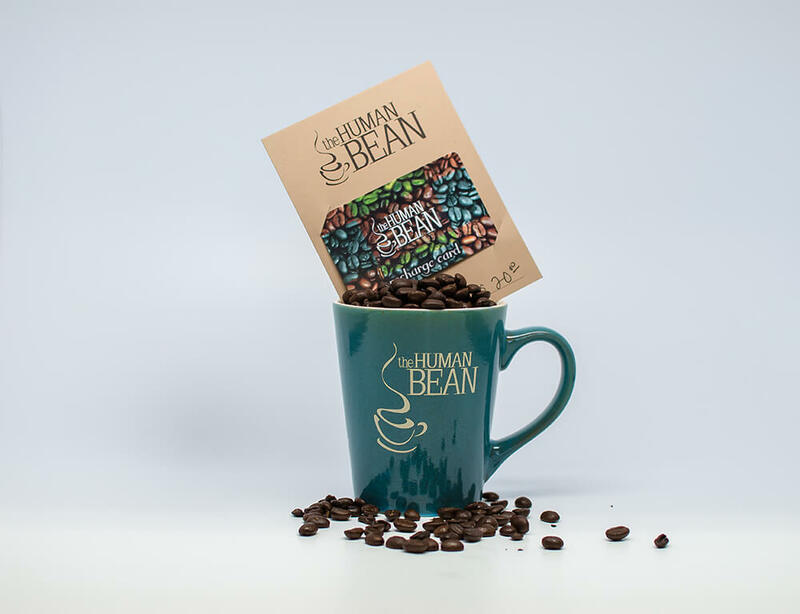 We guarantee we’ve got the perfect thing for all of the Human Bean lovers on your list! Gift cards always make a great gift! You can purchase them at any of our 82 locations or online. You can also give a gift card digitally through our Rewards App! Many of our locations also run varying gift card promotions this time of year where when you purchase a certain $ amount in gift cards you may receive a free drink so check with your favorite location! Our To-Go boxes are the perfect gift to bring to all of your holiday events! They can be filled with coffee or hot chocolate or your favorite Human Bean espresso beverage and stay hot for hours! We offer several gift package ideas for the Holidays. We combine our logo mugs with our beloved coffee and chocolate covered espresso beans to please the coffee lovers in your life! Our popular new Sustain cups are an affordable and fun gift! They are re-usable and recyclable too. Plus the proceeds from these cups go toward supporting a clean water project that we are funding in the coffee growing region of Cladas, Colombia. Everyone loves our Hydro Flask travel mugs! They keep beverages hot up to 12 hours and cold up to 24 hours. They also come in a variety of beautiful colors. Our signature chocolate covered espresso bean that is placed on every cup can also be purchased in bulk. Plus people love these things! We have a variety of hats, hoodies and t-shirts with the Human Bean logo. Show your love for our coffee with some new HB gear! You can buy all of your favorite coffee and espresso beans directly from our Roaster. They are all Farm Friendly and delicious.